With little ones around (two sweet baby girls under the age of two), I am always looking for fun, mostly mess-free ways to commemorate the holidays while making some special memories in the process. Keepsake crafts like this one are always an added bonus. When I found this super easy craft on Pinterest, I just knew I had to share it with all of you guys! Make this craft before you head out to Trick or Treat this year, and pull it out every year after. Have a safe and Happy Halloween Joy of Kids fans! We make our own new school year resolutions. You know the ones. We pledge to leave the house 15 minutes earlier every morning, to change out of our baby barf covered pajamas before hitting the carpool line, to feed our kiddos something besides Pop Tarts for breakfast, and to pack healthier, more satisfying school lunches. And in the beginning, we do a really good job. But a couple of weeks in, we start to lose steam. We get into a rut. All creativity goes out the window, and before long we’re handing our children a fistful of cash for the lunchroom vending machines as we’re dashing out the door. But the good news is it doesn’t have to be this way. There are numerous tools and resources online to help make this task more manageable. Here are some ideas to help you pack a healthier school lunch daily for your kiddos, without completely losing your mind in the process. Do what you can the day (or night) before. This means slicing veggies, packing up desserts and other snacks. However, you will want to save sandwich making for the morning of – otherwise your little one might complain about a soggy sandwich. And no one wants that. Got little ones at home? You can always make an extra lunch for yourself and your stay-at-home littles. This will save you time, energy, and a splitting headache at feeding time. Why make extra work for yourself? Buy Organic when you can, especially when it comes to buying the “Dirty Dozen” (produce). Avoid processed foods whenever possible – there are many quick, healthy, and homemade snacks you can pack with love for your littles instead. Think cheese, yogurt, fresh fruits and veggies, and nuts. Homemade trail mix and mini muffins make delicious treats. Leftovers from family dinner make fantastic lunch faire when in a pinch. You don’t have to kill yourself. Your child doesn’t have to have spaghetti made from squash in the shape of freshly fallen leaves. You are more than welcome to do so if you have the time, but don’t beat yourself up. Just make school lunch planning a part of your normal meal planning routine. You can plan month-to-month or even week-to-week. Here’s a link to a free, downloadable meal planner I use for my own family: http://giftsweuse.com/free-printables/weekly-meal-planner. This meal planner is very detailed. Pinterest has many options to choose from – select the meal planner template that is right for you own family and get to planning! Include these food groups in your lunch: healthy carbohydrates, protein, vegetables, and fruit. Again, avoid sugary snacks and processed foods whenever possible. Real food is always the best food. Feeling stuck? Search the web. 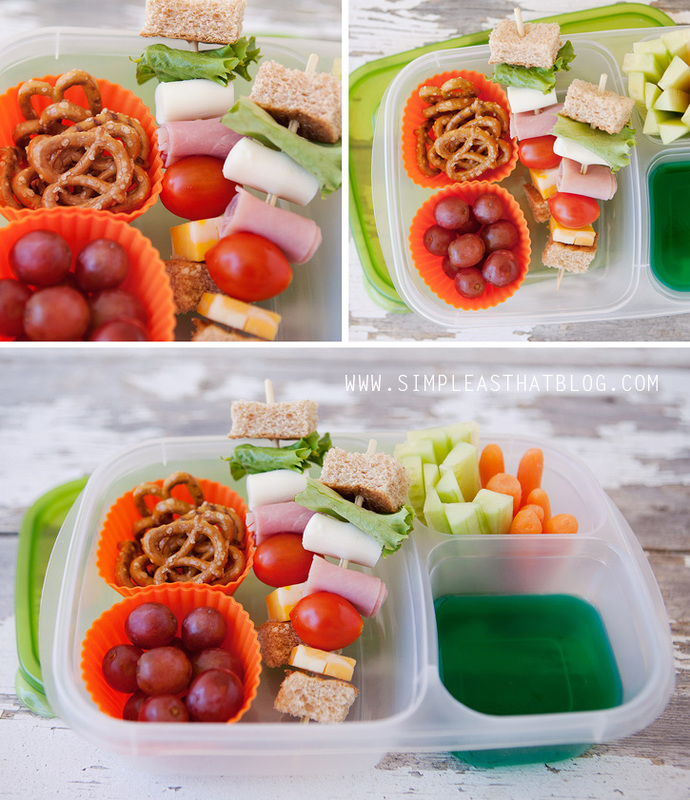 Healthy school lunch ideas from simpleasthatblog.com. You can find lots of good ideas online. Mommy bloggers notoriously love to share recipes and school lunch ideas. Mommy blogger Rebecca from simpleasthatblog.com, shares a week’s worth of school lunch ideas here. Recipes include items like sandwich kabobs, pizza buns, and something called a butterfly sandwich. You can find about a dozen school lunch ideas and a FREE printable at meetpenny.com. She’s got recipes for Macaroni Smiles, Pita Pizza, Caprese Bagels, and BBQ Chicken on a Bun. And if you’re really struggling, you should definitely check out MOMables, a school lunch meal planning service that helps parents feed their kids a variety of lunches both moms and kiddos are sure to love! You can read more about MOMables here. Born and raised in Southeast Texas, Jessica currently lives in Billings, Montana with her husband Tyler, her one year old Savannah, and their newest addition Emma Kate (six months). Jessica is a freelance writer, photographer, and blogger, and works as a licensed Realtor for Berkshire Hathaway Home-Services Floberg Real Estate. In her spare time she enjoys watching the Food Network and hanging out with her family. I LOVE my GroVia AI2 cloth diapers. I have a pretty big babe (23 pounds at 10 months) and she still has plenty of room to grow in them! They seem like they would be pretty comfy as the elastic doesn’t dig the way some other CDs (cloth diapers) do. They also seem like maybe they would be a little cooler than some other CD brands. They are pretty trim (CDs can be pretty bulky) which is always an added bonus. They dry super fast (like nearly dry right out of the washer). I only have the snap variety which I chose for a couple of reasons. Snaps generally have a longer lifespan than Velcro and are harder for babies to take off themselves (because apparently at some point they do that-oh goody). That being said, the GroVia Velcro seems super nice (not scratchy) and I’m sure would wear well! With Velcro you have to be sure to stick the tab down so it doesn’t stick to everything, and so lint doesn’t get in it, therefore prolonging the life of your Velcro. 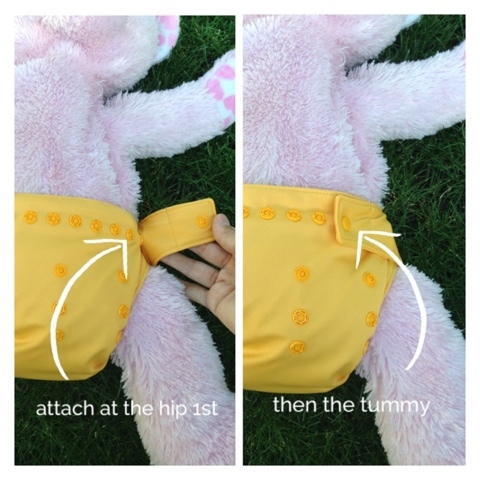 There are two snaps on each side (so four total) when diapering your baby. One at the hip and one more at the tummy (don’t mind my teddy bear model, my little one was feeling under the weather). They are a one size diaper and have different rise options for smaller babies. I didn’t start using CDs until Rosie was in the largest rise setting so I can’t attest to how they work for a smaller babe, but the rise snaps are pretty standard with all the other CDs out there. The shells come in a variety of fun colors and prints which make them even more fun to use! Photo below shows that you need to make sure the soaker pad is completely tucked in the diaper or you will have some leaks! There are two different kinds of soaker pads that I have used: the organic cotton soakers and the stay dry soakers. The soaker pads come in a 2-pack separate from the shell. The organic cotton soaker pad is not fleecy, the stay dry soaker is fleecy (made of a hemp blend). The organic cotton soaker takes a little bit longer to dry than the stay dry soaker although both of them (with all their awesome layers to absorb) take a bit of time to dry. 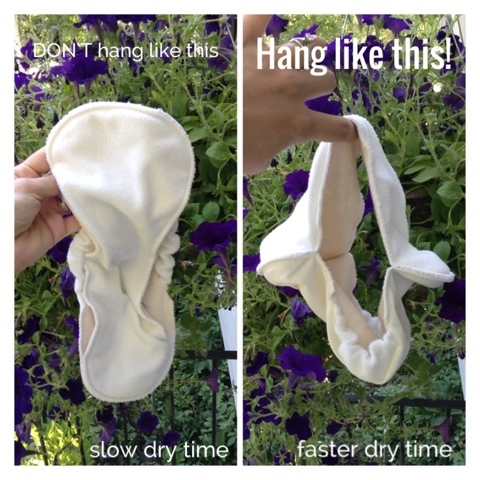 I only line dry my diapers in order to extend their lifespan as long as I can. I have learned to separate the layers in order to speed up drying as fast as I can (see photo). Both varieties of soaker pads are gussetted which acts as a ‘poop fence’ (as my sister-in-law and I lovingly refer to them). They make sure that everything stays in the diaper which is obviously ideal. 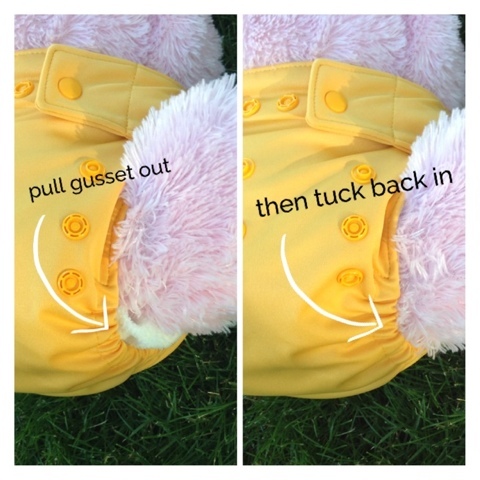 😉 I pull these gussets out as far as I can while still keeping them in the shell to help with absorbency and keeping solid matter in the diaper. Between the two I prefer the hemp blend stay dry soaker pad because 1) it dries faster and 2) I feel like its fleecy material maybe wicks moisture away from the baby better. They both work great though! I also use the GroVia Perfect Pail hanging wet bag. I LOVE it. I was skeptical that it would contain smells adequately since it isn’t tightly sealed shut but I’ve actually come to learn that a little oxygen flow helps diaper pails not smell so bad (as opposed to being tightly closed). It holds 3 days worth of diapers which is perfect (I do diaper laundry every 3rd day usually, sometimes every other if need be). It is washable although I probably only wash it every 3rd load of diaper laundry (I do let it air out each time I wash diapers though). It is so easy to just slip the soiled diaper in the opening on top and to unzip the bottom of the bag over the washer so all the diapers just fall right in (no contact with dirty diapers necessary)! I have it hanging behind the nursery door. I absolutely recommend this wet bag for convenience alone. My next product I love (apparently I really love all things GroVia) are the BioLiners. 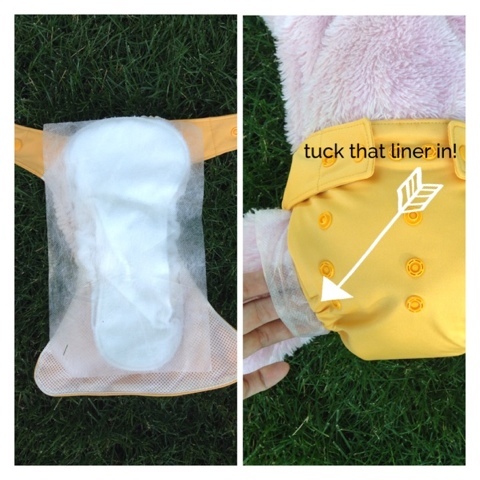 They are a disposable liner (the feel of them remind me of a dryer sheet) that allow moisture to pass through but creates a thin barrier between poop and the actual soaker pad (make sure it’s all tucked in the diaper though or the wetness will seep out)! The benefit of them is that when you go to clean a poopy diaper you just carefully grab a clean corner of the liner and dispose of it. I flush mine and haven’t had any problems despite the old plumbing in my home. It’s great because a great majority of the poop sticks to this liner leaving less solid matter to scrape or spray off. I have used the Magic Stick (diaper rash treatment) a couple times when Rosie’s bottom gets a little red (which is not often at all) and 1) it smells so nice 2) it’s awesome that you don’t actually have to touch the ointment. It dispenses like a stick of deodorant so you can apply it where needed without having to touch it. FYI, diaper rash ointments from the grocery store inhibit absorption so be sure to use only cloth diaper approved treatments with your CDs! I use cloth wipes as well as my CDs, just made sense to me to throw them in with the dipes instead of having a separate trash can for poopy wipes (floating around uncontained). I use the basic cloth wipes GroVia sells and really like them! They are nice and thick and soft and just one almost always gets the job done. I only use wipes in the morning when baby has been in a wet diaper for a longer period of time and at poopy diaper changes, otherwise I just let her air out (best for baby anatomy)! When I change a poopy diaper I use the soaker pad that’s in her diaper–before taking it off I wipe down with it to remove the majority of poo from her behind. By doing so I then just have a little clean up to do with the wipe. Now, if I didn’t do that I would have more solids on the wipe and would have to remove it in the toilet somehow (scraping or rinsing). By making sure to wipe down with the diaper first I only have to remove solid matter from the soaker pad alone (I hope that makes sense to someone out there!). I have 2 sets of 12 cloth wipes and one set fits perfectly in my wipe holder. I have great intentions to someday make a wipe solution but at this point I only use water which works just fine. All in all I am just really happy with the GroVia line. I love that they are based out of Bozeman, Montana and that I can buy them locally at the Joy of Kids! Sarabeth Engels is a mommy blogger who is passionate about breastfeeding, cloth diapering, recycling, and sharing her love for Jesus. Check out her blog at thecrunchyconservativemama.blogspot.com.